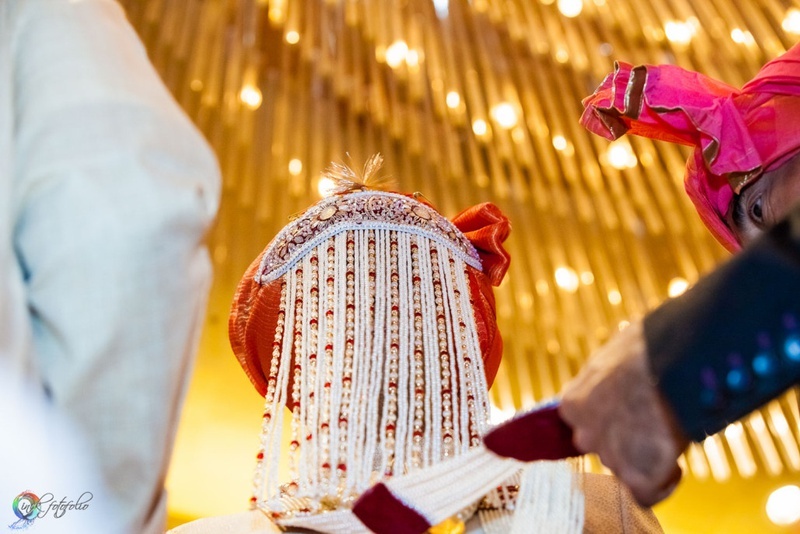 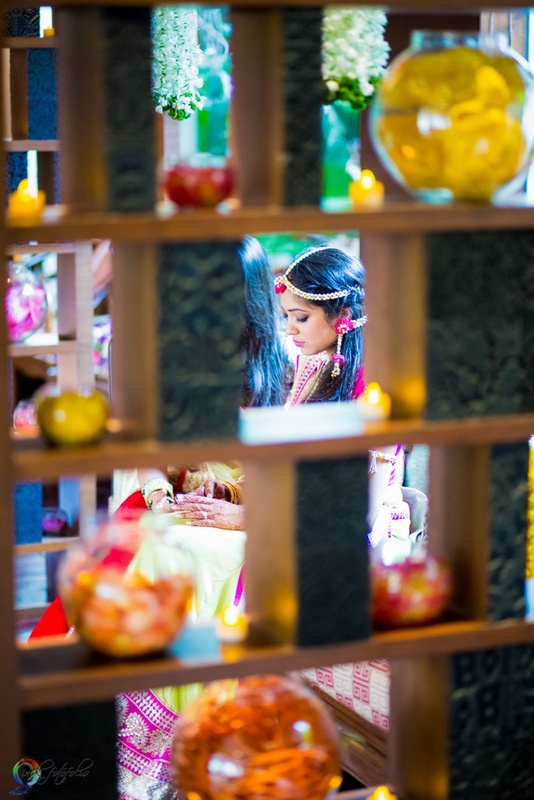 Gorgeous glass chandeliers strung above an indoor mandap, Vedic singers singing sweet melodies to the Gods, a stunning bride and a groom in love – this Punjabi-Vedic wedding was as beautiful as it could get. 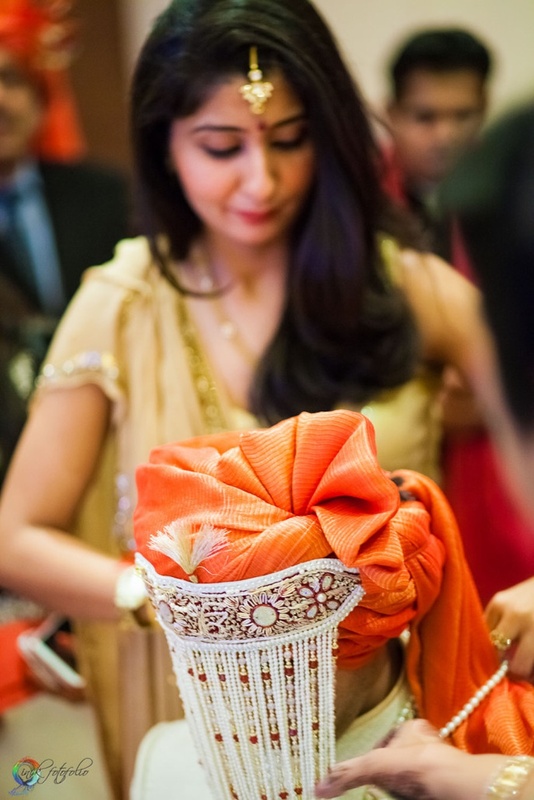 Even though it was followed by the usual sangeet, ring ceremony, reception and pheras, it was absolute fun! 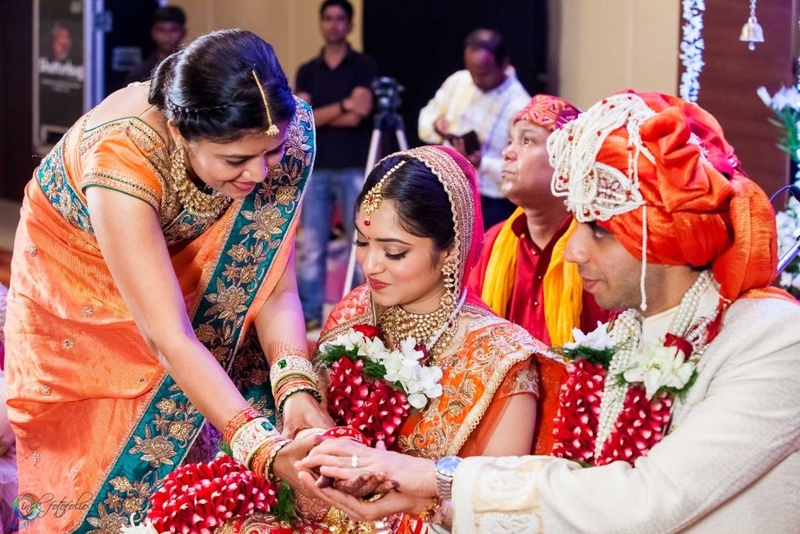 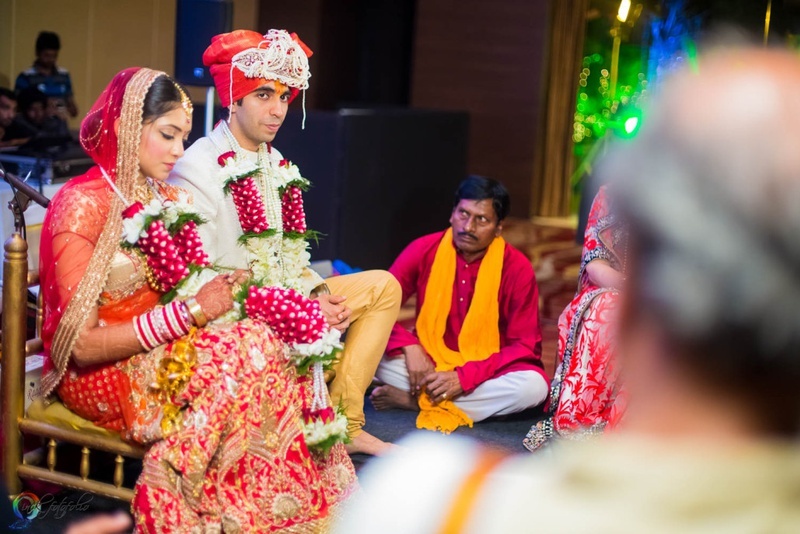 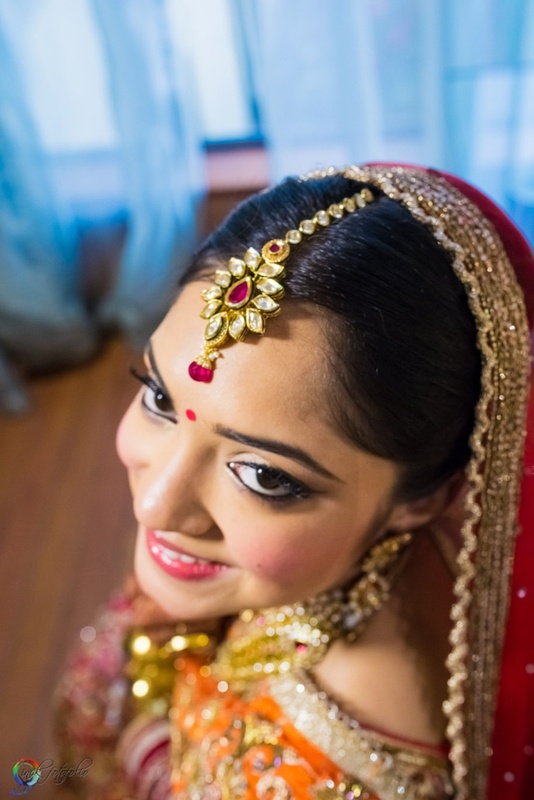 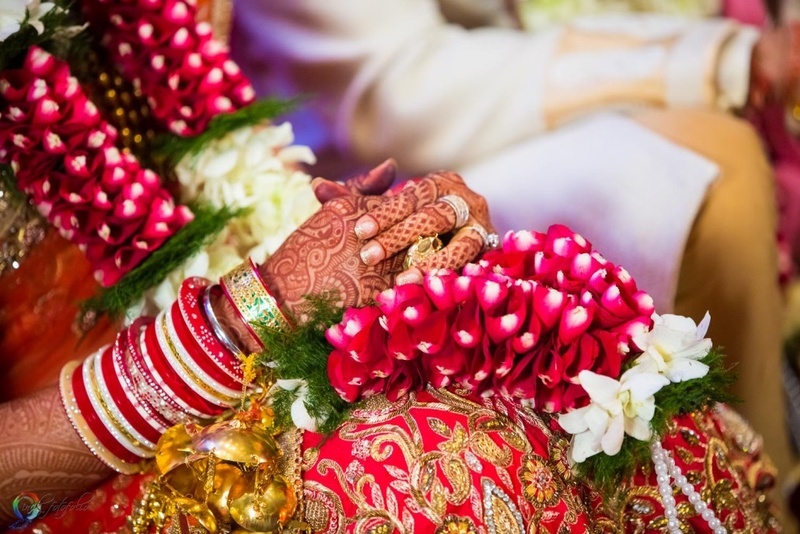 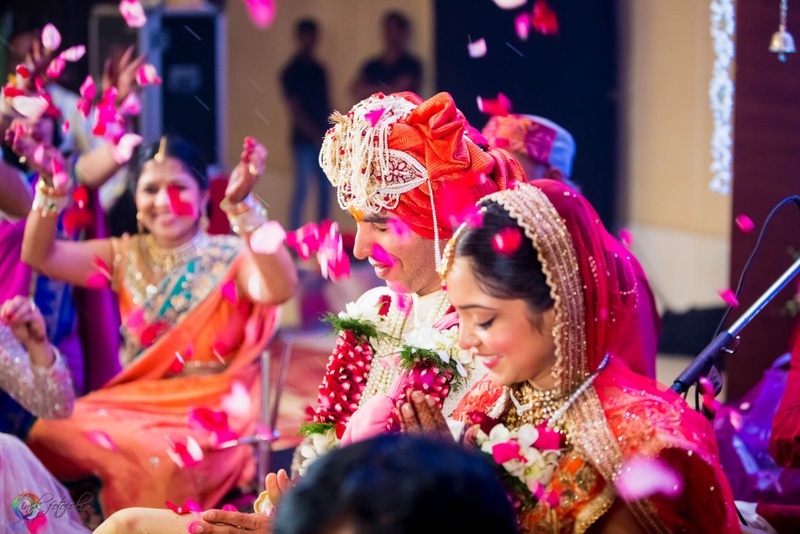 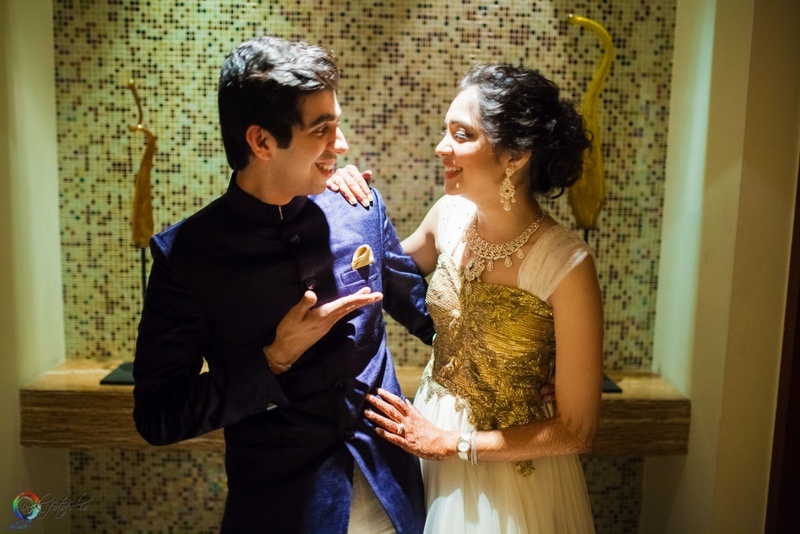 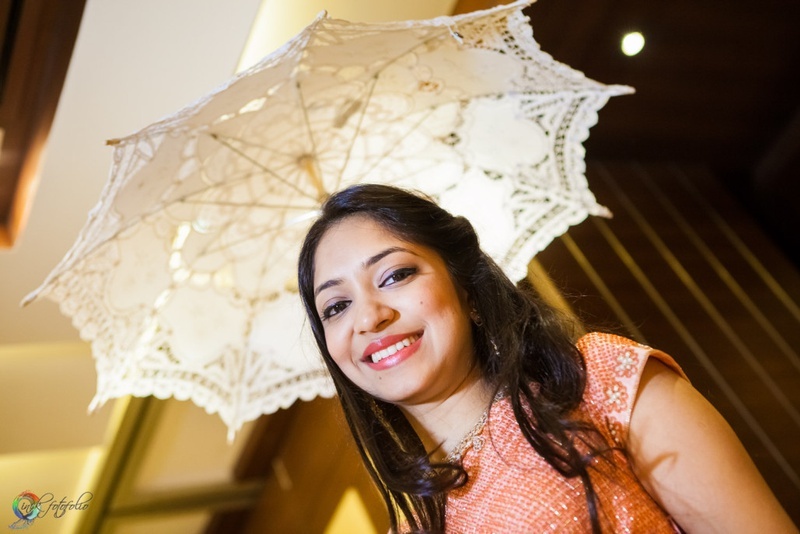 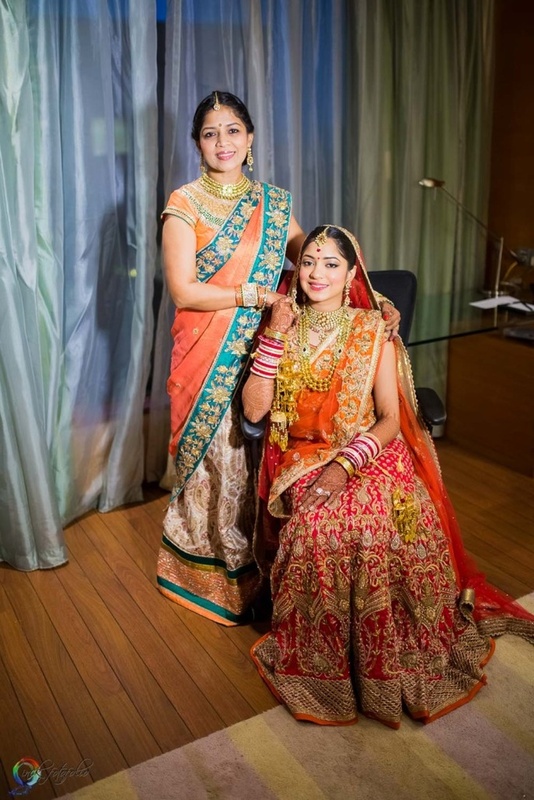 It was a dream wedding which Rakhee planned to the T.
Celebrations began with the beautiful mehendi ceremony held in Ban Tao, Pune, where the bride-to-be was adorned with floral jewellery. 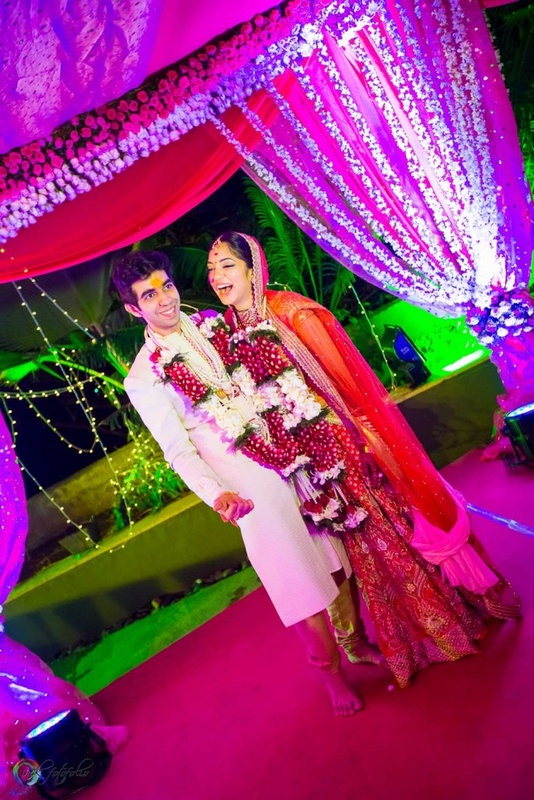 She wore a stunning anarkali in hues of lime green and purple with intricate gold and silver zari work on it. 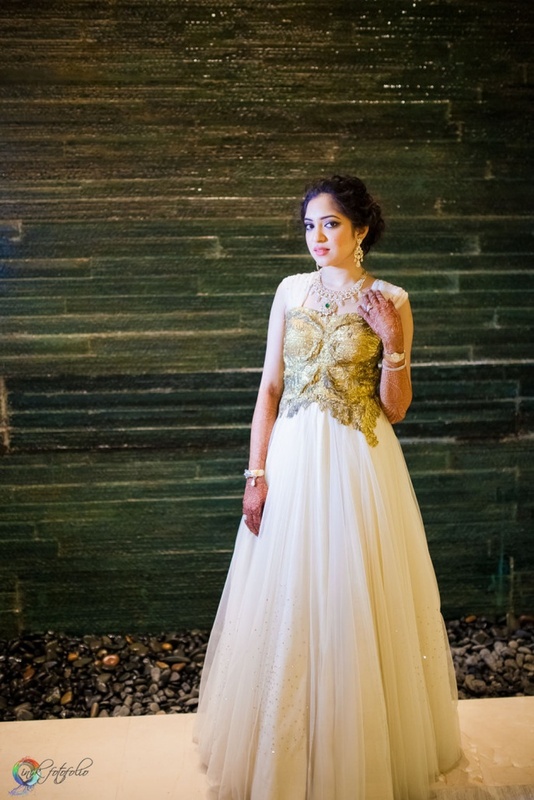 Rakhee looked like someone straight out of a fairytale in an A-line gown, which had a gold textured bodice representing a butterfly-like pattern. 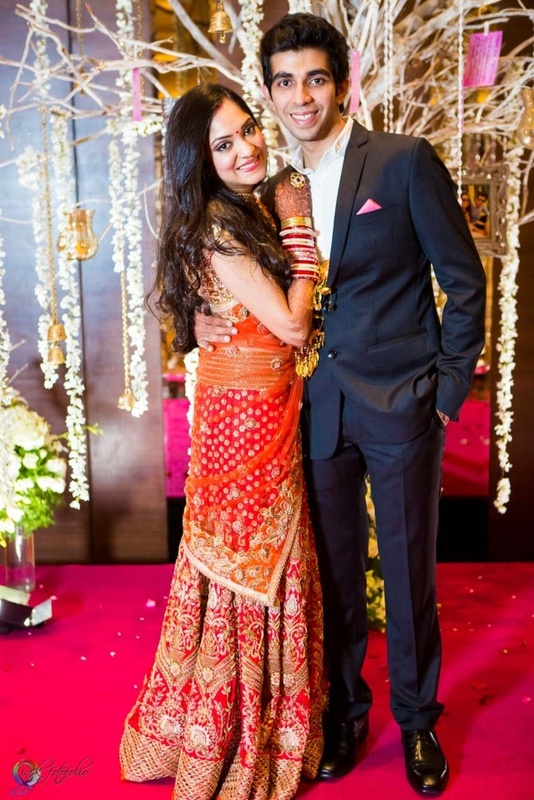 She paired this gown with an elegant diamond- and emerald-studded necklace with matching earrings, while Rakshit looked equally ravishing in his navy blue suit. 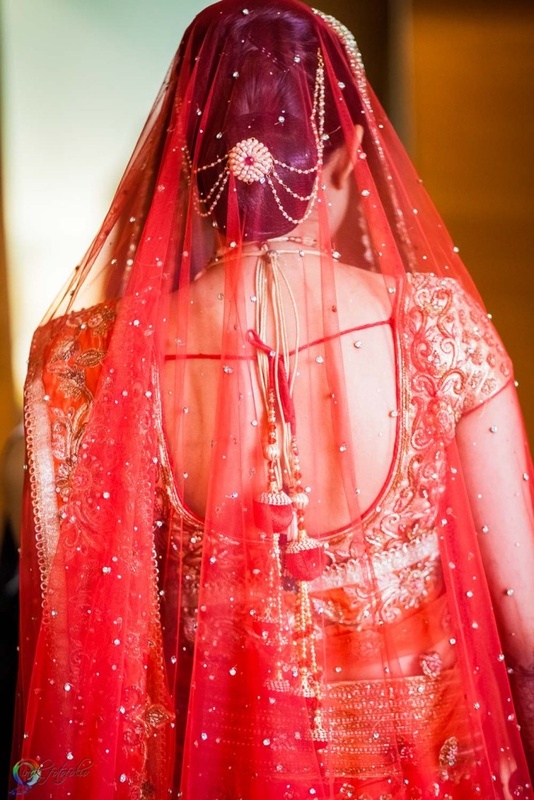 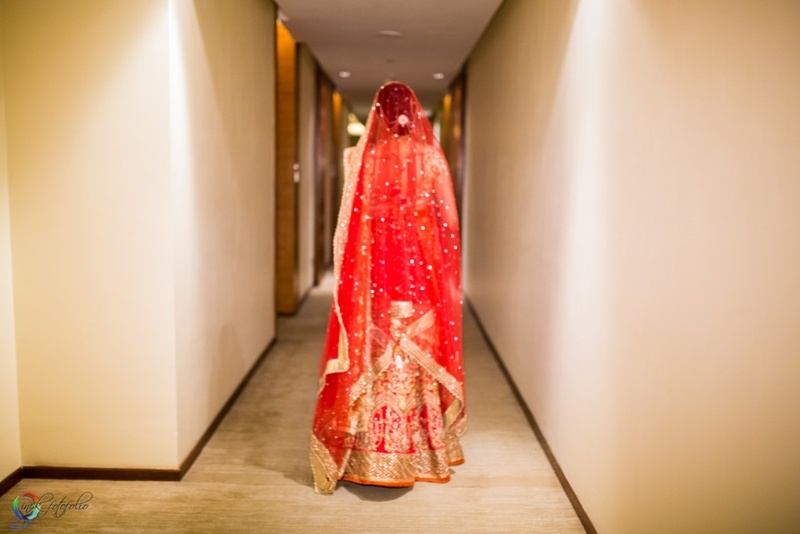 Rakhee entered the opulent wedding venue under a sheer orange bridal dupatta wearing a red and orange lehenga, intricately embellished with embroidered motifs, floral buttis and sequins. 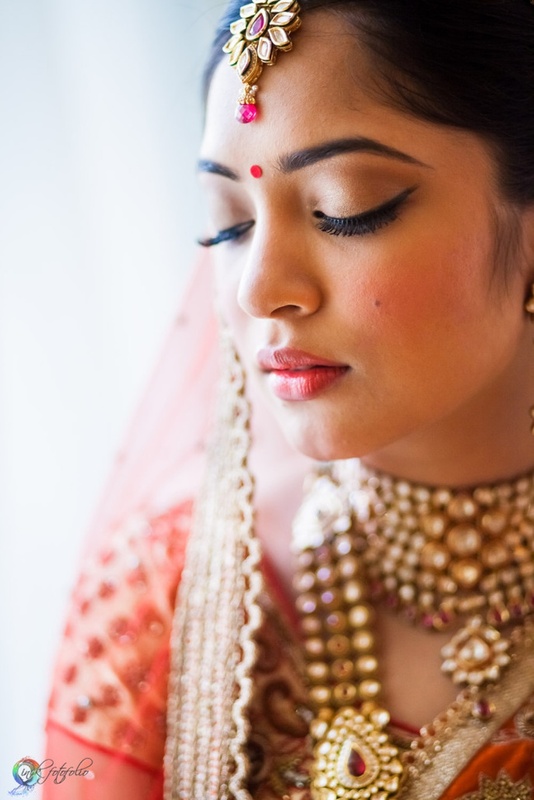 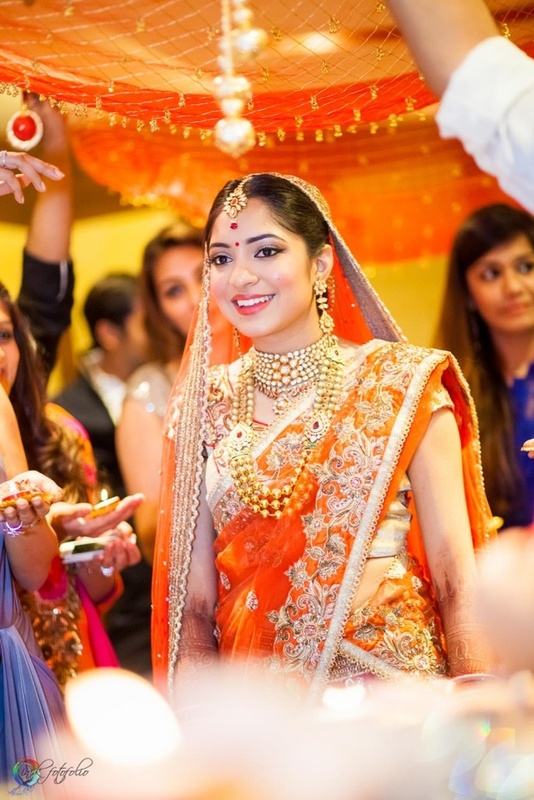 She donned stunning bridal jewellery which included a polki choker, multi-strand rani haar and matching maangtika. 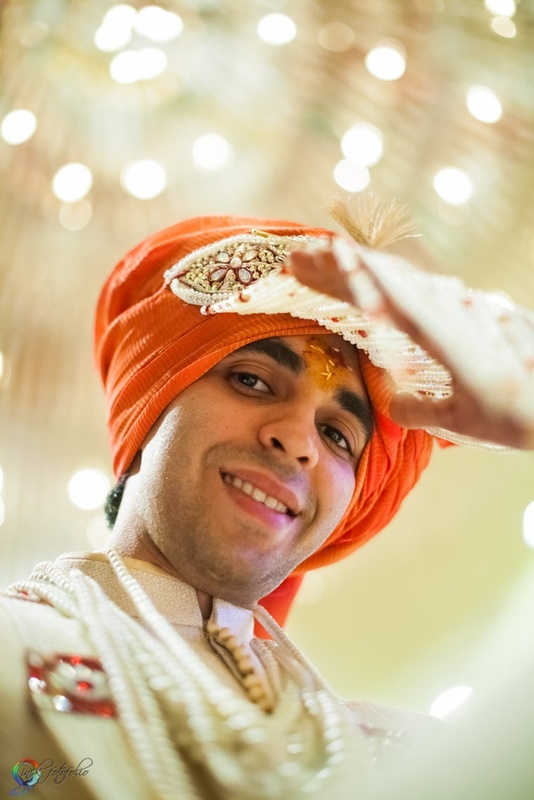 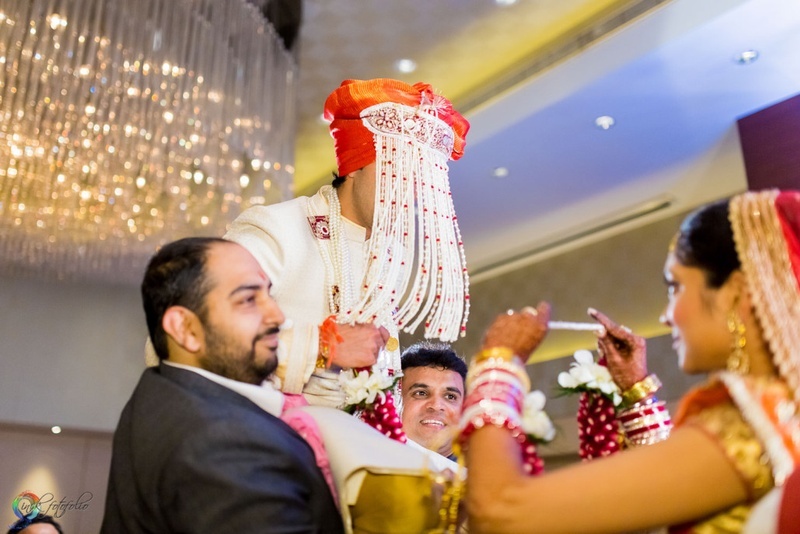 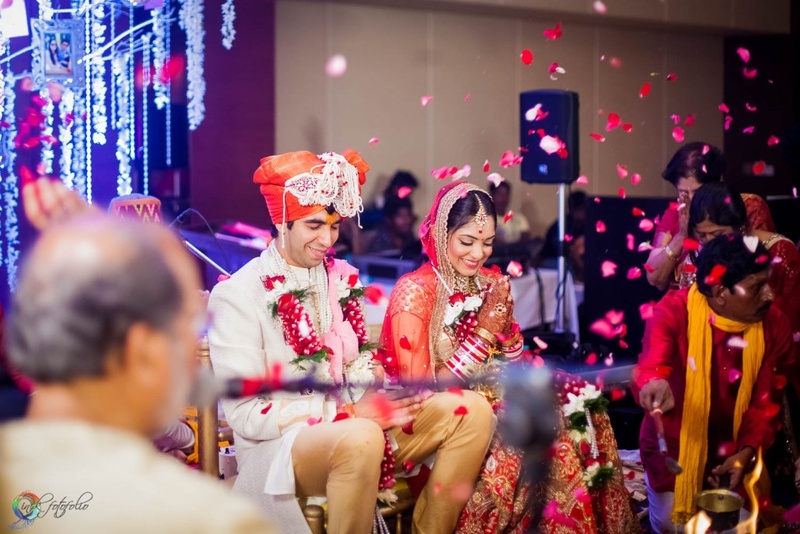 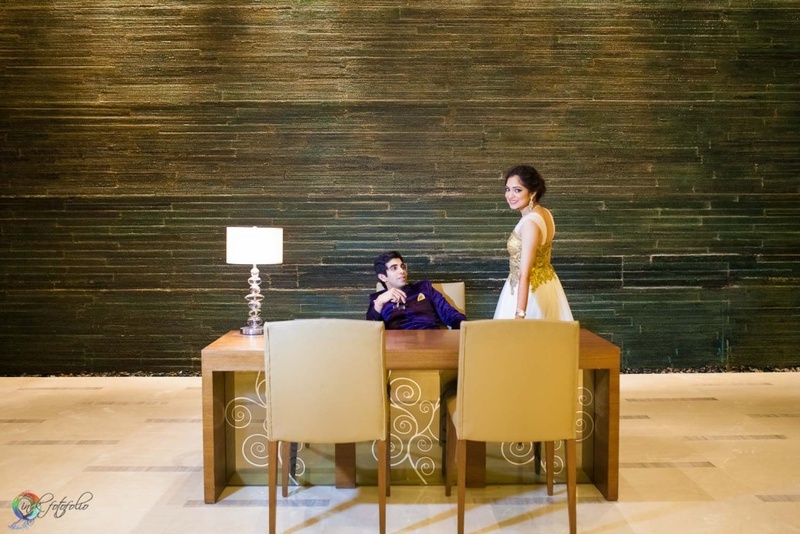 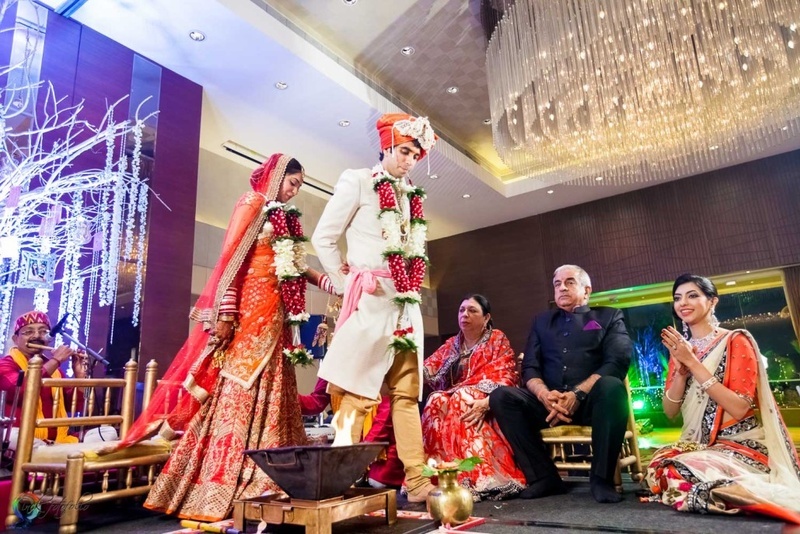 Her handsome groom followed suit in his classic ivory sherwani and gold churidar. 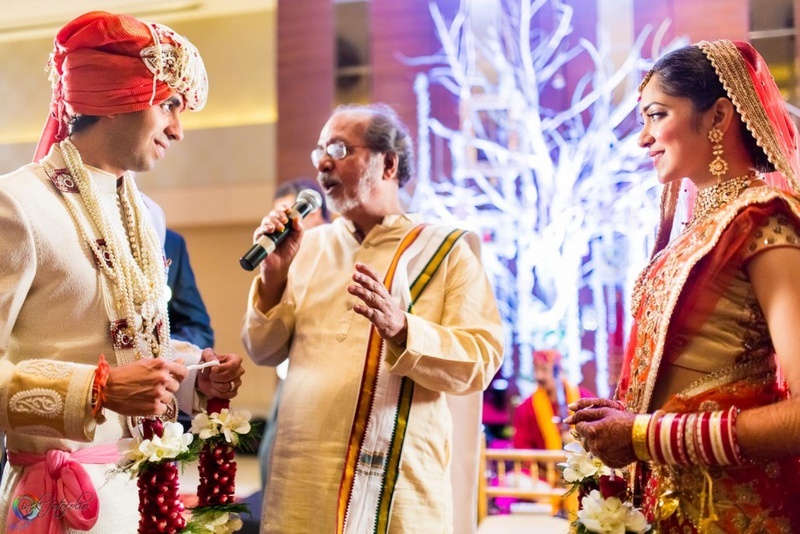 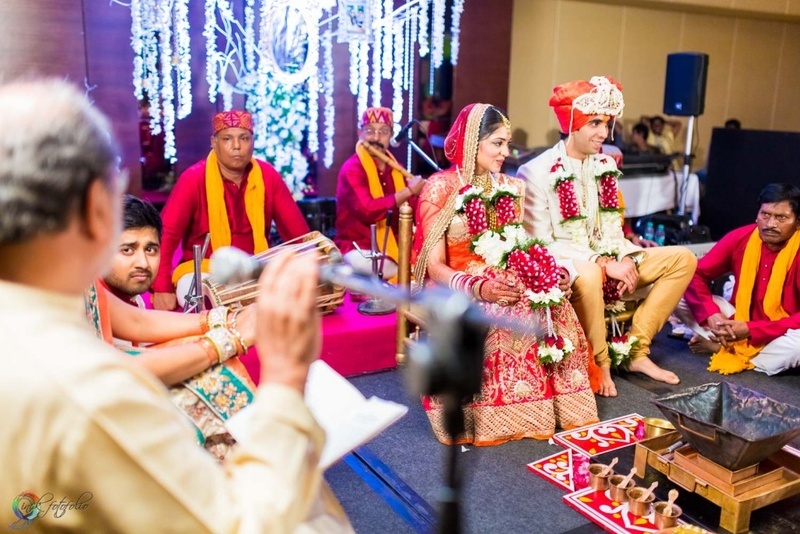 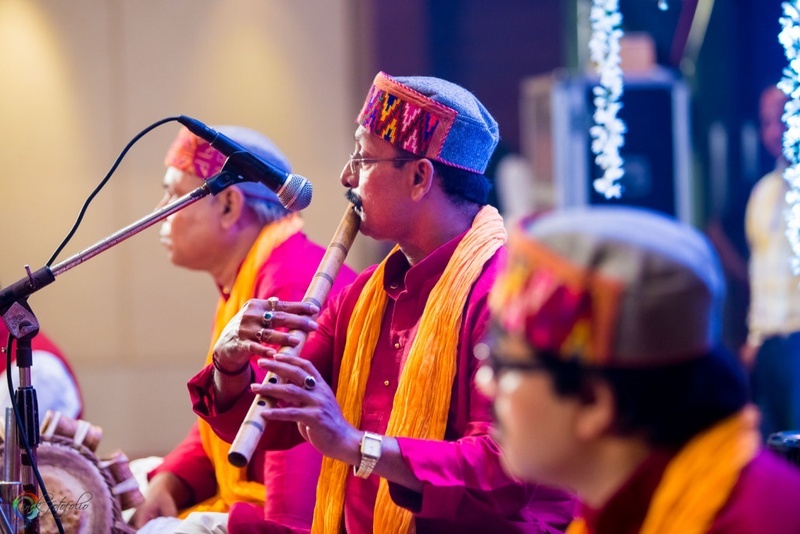 The glass-string chandeliers, white painted wishing tree and the Vedic singers added the right amount of eccentricity to this traditional wedding affair. 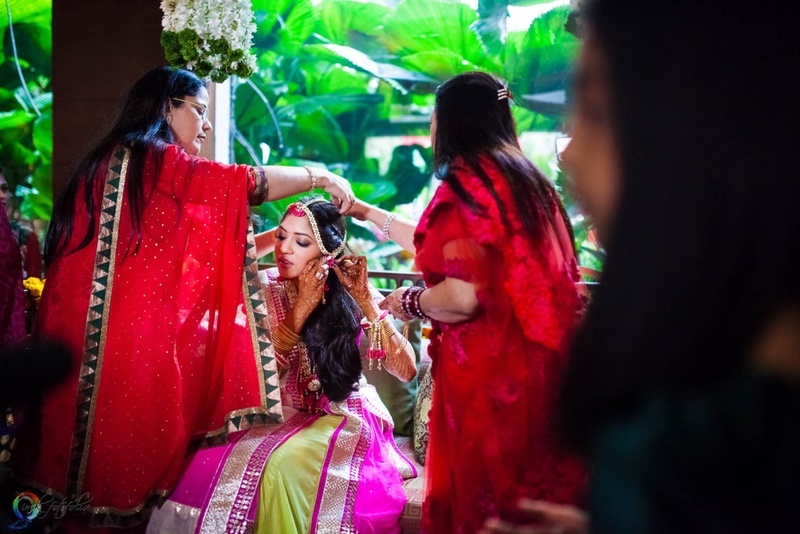 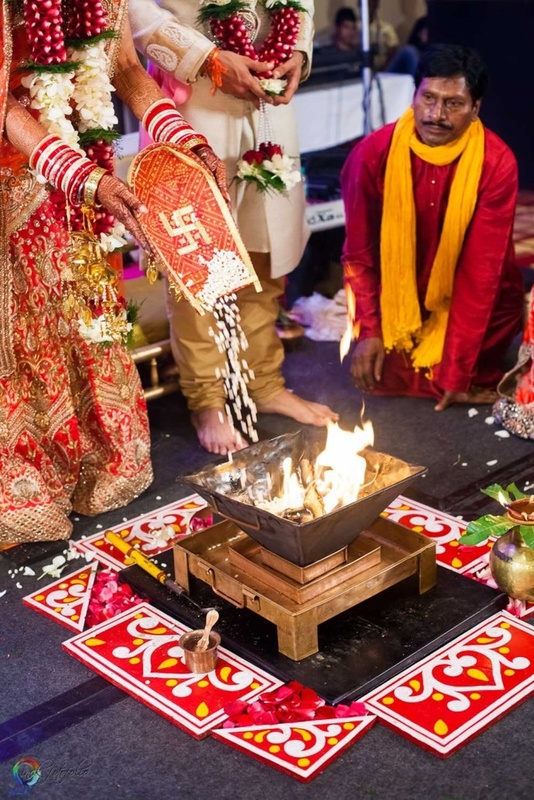 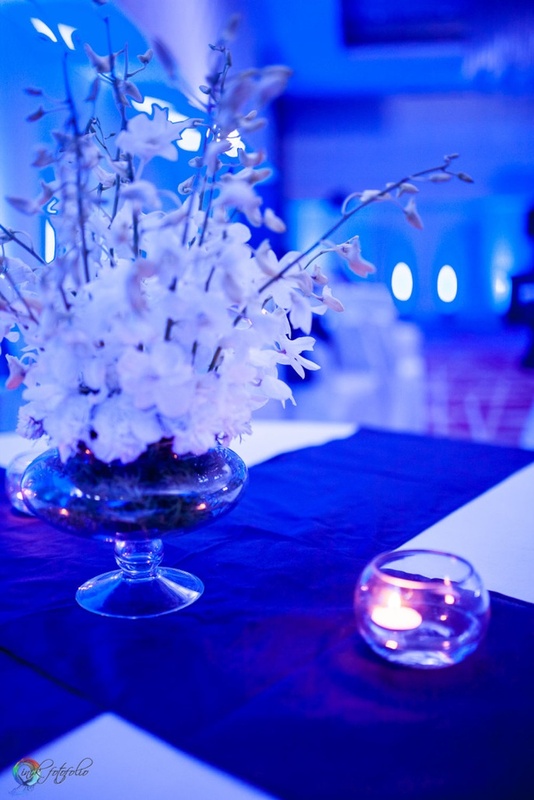 Even with all the serene distractions, the team at Scarlet Weddings did an amazing job in capturing every beautiful moment from Rakshit and Rakhee’s union with perfect precision! 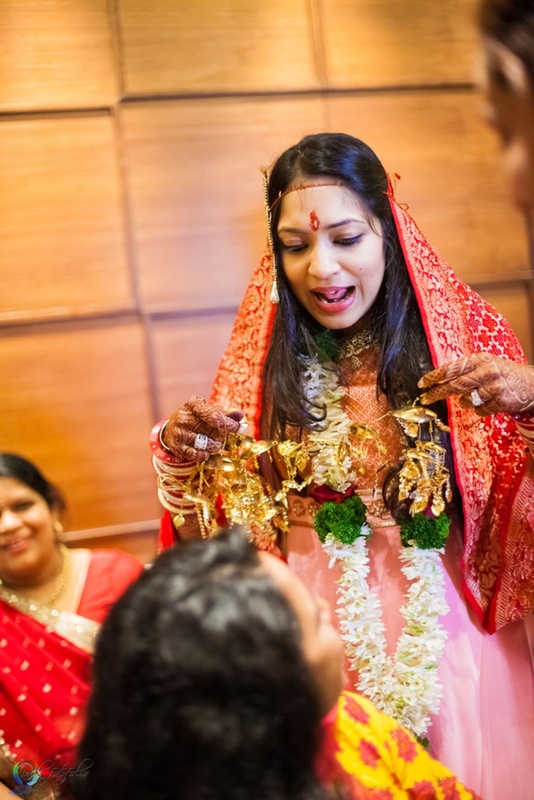 Floral mangtikka made with rose petals and jasmine buds.